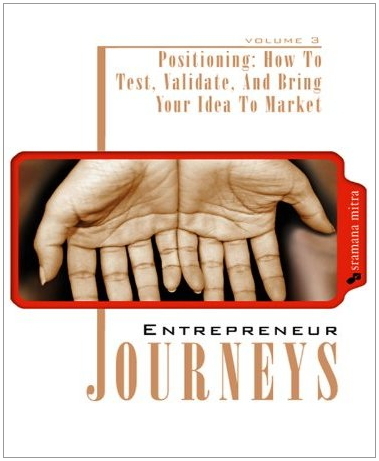 I already spoke twice about Sramana Mitra – the reality is that she writes a lot and here she is again with the third volume of Entrepreneur Journeys: Entrepreneur Journeys v.3: Positioning: How To Test, Validate, And Bring Your Idea To Market. Sramana chooses four domains for this book: Going Vertical, Cloud Computing, Collaboration and Content Publishing. As usual, she illustrates each topic with case studies — more specifically, with interviews of entrepreneurs who recount how they approach their respective markets and address them adequately — responding to real expectations and trying to do it better than their competitors. What makes TheFind a more satisfactory experience than Like.com, for example? This is one of the topics that founder Siva Kumar had to think about. What are the secrets of Kosmix’s or Stardoll’s customer acquisition strategies, or of the integrated advertorial campaigns at Glam (headed by an old friend of mine, Samir Arora)? Cloud computing under its various forms, Sofware-as-a-service (SaaS), Infrastructure-as-a-service (IaaS) or Data-as-a-service (DaaS), continues to re-architect the industry. Sramana warns her native country: “the cloud computing mega-trend plays against India’s tradition of answering all scaling problems with more bodies.” Meanwhile, Ken Rudin (LucidEra) wants to shake up the somewhat stagnant business intelligence industry. To understand a successful roll-up strategy, read the story of Mike Cordano and Keyur Patel, the co-founders of Fabrik, acquired by Hitachi, earlier this year, and to optimally operate in overcrowded or difficult spaces, take a look at Ken Plunkett’s journey at Salary.com, Jim Heeger’s value proposition at PayCycle — or, in an entirely different world (gaming), at John Welch (PlayFirst). These entrepreneurs may come from any country: Umberto Milletti (InsideView) was born in Italy; they may have started with traditional jobs: Steve Adams (Sabrix) used to teach English and Kevin Weiss (iUniverse) spent 17 years at IBM. They can even be a VC, such as Brian Jacobs from Emergence Capital! They all like challenges and do not hesitate to take on big players as does Sharat Sharan (ON24), D.D. Ganguly (DimDim), or to venture into bourgeoning markets where others are already staking claims as Jeff Housenbold (Shutterfly). In all cases, these entrepreneurs have a passion for what they do and are comfortable answering questions related to their value proposition, their competitive positioning and pricing. They are on top of the sales cycle and messaging. They know how to qualify leads and have clear execution roadmaps. You will enjoy reading this book and will easily relate to the entrepreneurs that Sramana interviews. When you are done, take the time to try to respond to each of the questions listed in her “Appendix: Clarify your story.” This may be a grueling exercise — but do go out there before you have real answers!